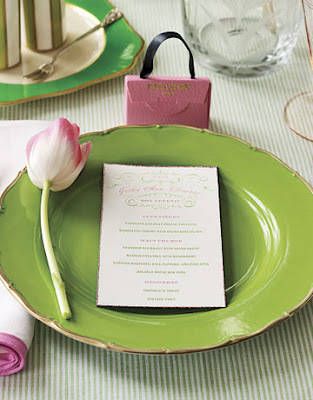 My Sweet Savannah: Spring Tabletop and Decorating Ideas! 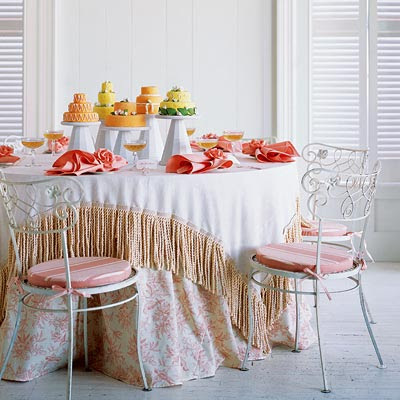 Spring Tabletop and Decorating Ideas! 1. Find new uses for items you already have. 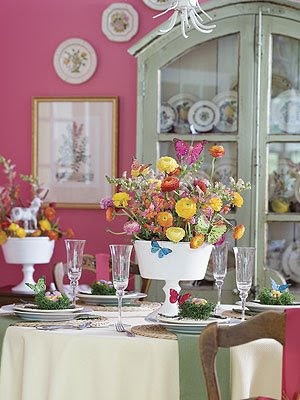 Decorating for spring does not have to be expensive. 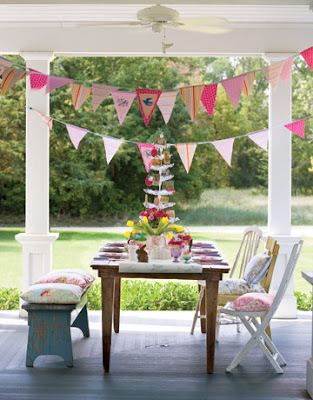 In fact, being creative in the ways you decorate can make it seem like a treasure hunt! Search for what you currently have in the way of spring themed accessories. 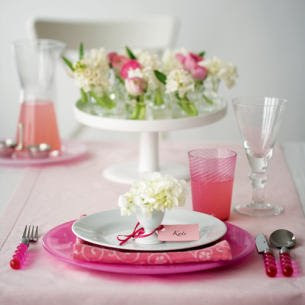 Look for beautiful vases you have stored away, white linens to use for the table, silk flowers that you’ve packed away. 2. Decorate with flowers. 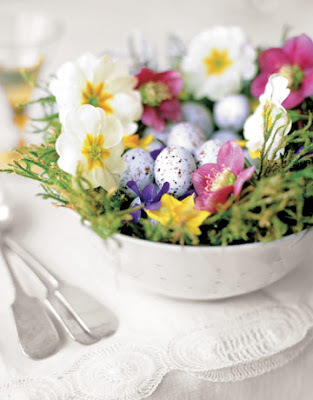 For example, place spring silk flowers or ivy in vases or bowls that you already own. Wind silk ivy leaves along window treatments. Buy small flowering shade plants such as petunias or zinnias and place them on tables inside the house. I’ve found lots of spring silk flowers at the dollar store. 3. 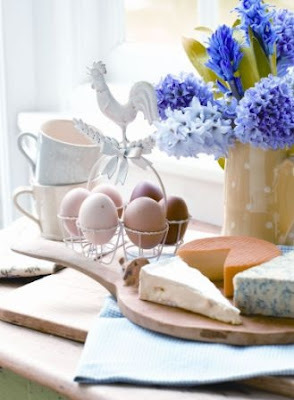 Decorate your kitchen table. 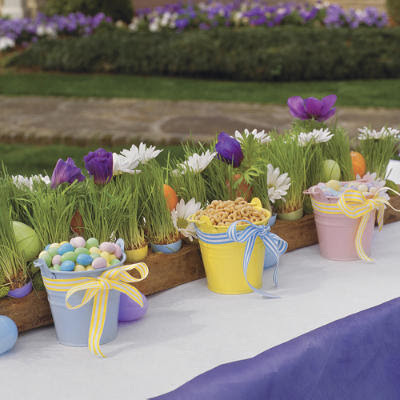 For table decorating use a spring theme tablecloth and create centerpieces using spring themed silk flowers, or fill vases or bowls with plastic easter eggs. 4. Start a small container garden. Herbs are perfect for growing in small spaces. Save old juice or soda bottles to be used as the containers for your garden. Tie spring colored ribbons or bows around them to decorate. 5. Decorate your front door. Add a spring theme wreath to the front door or place a nice potted plant with a big bow in the front entry way. 6. Hang or display a spring flag. I’ve seen lots of spring designs with flowers and other related motifs. 7. 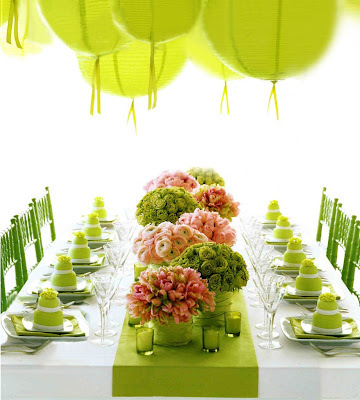 Visit your local dollar store to get inexpensive spring decor items. 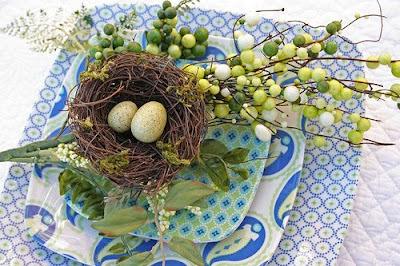 You will likely find spring seasonal decor including decorating accents such as items for an Easter theme, as well as silk flowers which could be used for a table centerpiece or arrangement. If you need some creative ideas, check out the home improvement and craft stores in your area for more decorating tips. Many times you can find an idea that you can replicate at home using items you already own. Browse the latest home and garden magazines to find spring decorating ideas. I find wonderful inspiration from other design ideas. Check out your local library for the latest decorating magazines. all these ideas came from this great blog! The colors in these photos are amazing! Bring on the spring! I am so ready!! My favorite kind of decorating ideas! Great inspiration. Bringing Out Your Inner BOLD! Bill Blass said, “Style is primarily a matter of instinct.” Decorating takes on a new meaning for each individual. Clever and chic for Janie may be yesterday’s yawn-fest for Carol. Different tastes in décor mean different furniture, artwork and color palettes. So what is the rule of thumb for making your place zing if it’s not a certain style, pattern, or color? Bold, baby! Bring on the bold! Boldly say what you want to say when designing a room. Make a statement and let your personality shine through. If you go in for the palest blues to soothe and relax, add a custom zing to make it pop! Love black and white photography? Maybe even some of that ultra-hot photo alphabet wall art in black and white? Splash in some passionate pink or revved up red on the wall to make it sizzle. No longer are walls content with neutral shades. Any color of the palette goes! Splash on muted melons or eccentric eggplants with savvy sage. Classic colors cozy up with velvety crimsons and Dijon yellows. Color is fantastically bold and beautiful! Rich textured throws, swags, rugs and runners jazz up every room, every time. Patterns are all the rage now, too. Twists and twirls, paisleys and pearls-bold is key! Did you ever in a million years think of dotting stripes and striping dots? Designers these days are pulling out all the geometrical stops. Paisley mixes with all sorts of combinations-checks, polkas, and weathered solids. Discover a new way of looking at the world around you in different shapes and deigns. Mix it all with gorgeous gilding in silver and gold. Toss in a few well-chosen accents-bold and beautiful. And with the trend of decor becoming more and more personalized, a meaningful piece of photography will make you feel right at home. Black and white as well as the historic look of sepia photography looks gorgeous in any room. Add all these ingredients together, and you’ve got yourself a decorating design that not only expresses your individual style but does so as personally and beautifully as you want it to. Whatever you want to say while decorating, say it with your own personal sense of style. Put it out there for the world to see and don’t look back! Embrace your individuality whether your nature is “Janie jazzed” or “Carol calm”. Express yourself! When people enter your home they’ll shoot you a complementary smile, knowing it looks and feels sooooo perfectly like you. And no one can do YOU better. Amp up that “you” factor, bringing the bright lights, bold city look to the forefront with clever photography of New York architecture and nature. 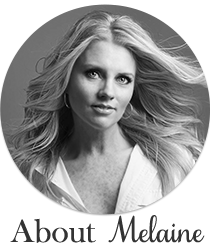 And, if it’s gorgeous enough for your home, you KNOW personalized photo gifts are great for any occasion! Create your own personalized name art with Photos That Look Like Letters at http://www.alphabetpix.com! I just discovered your blog and think it is beautiful. Great Job! These are beautiful. I need some beautiful Tabletop Kitchen Items. Thanks for inspiration. Keep exploring. There area unit lots of monthly magazines, leaflets and news sheet that area unit entirely dedicated to agriculture. Another place to seem is for books on this subject. These books is found almost anyplace from home improvement stores, bookstores, even your public libraries.